Other topics - beer-related or not. Why are apartments called apartments ? Is superoo the same guy who was on v8 supercars a few weeks back in New Zealand. They had a helmet shot where superoo was superkiwi instead. Beer numbs all zombies !!! 'Apart'ments are all stacked together. They're not 'apart' at all !! 'tis from the Italian word "appartimento" actually, the meaning is derived from multiple people living in the same house, and they started to build ways of keeping them "apart", i.e. dedicated kitchens, etc. Apartments evolved from there. Gave my old lady a pot of my JW tad ale/ simcoe SMASH. Admittedly it is close, but I have committed myself to learning ingredients. 5 brews all jw trad with different hops. It is now time to work on malt. That moment when you realize you just bottled half a batch without priming sugar. .. I have a batch I brewed almost a year ago, and it still hasn't carbonated. I could infuse the bottles with some more yeast, but the quality of the beer isn't really up to scratch. I'll need to tip them all at some stage. Will be a sad day, having never done that before. I bottled a Porter yesterday. The end of the little bottler came off in the third last bottle. I hope I don't drink it. 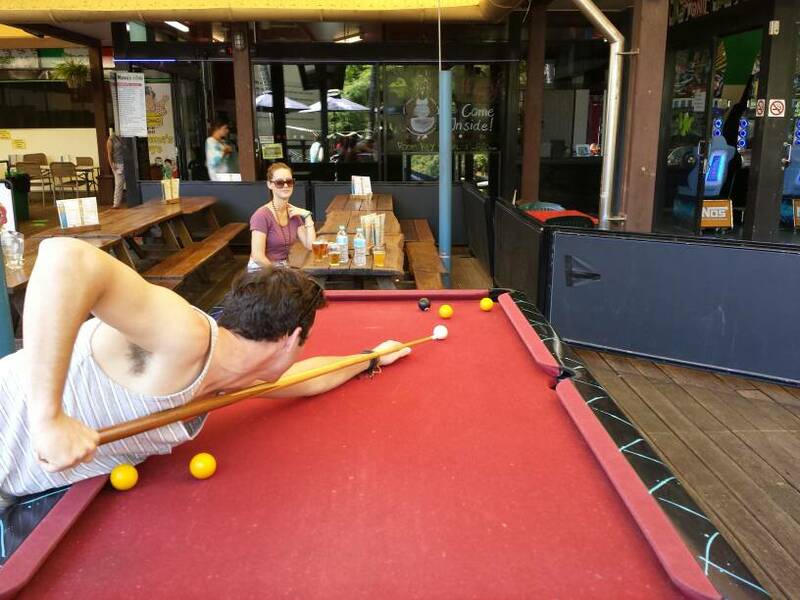 Having beers and playing pool at Magnums Hotel Airlie Beach for fathers day... winning. Looks like a tough afternoon ahead. Beers at the local are that expensive that no one goes any more. Magnums is a backpacker frindly pub so prices are pretty good. $4 schooners and $11 jugs of local lager. Not the greatest beer but ok for the price.